Fighting broke out between police and protesters in Turin, Italy, after riot police tried to stop a group of demonstrators from entering the San Carlo square during the annual May Day protest. 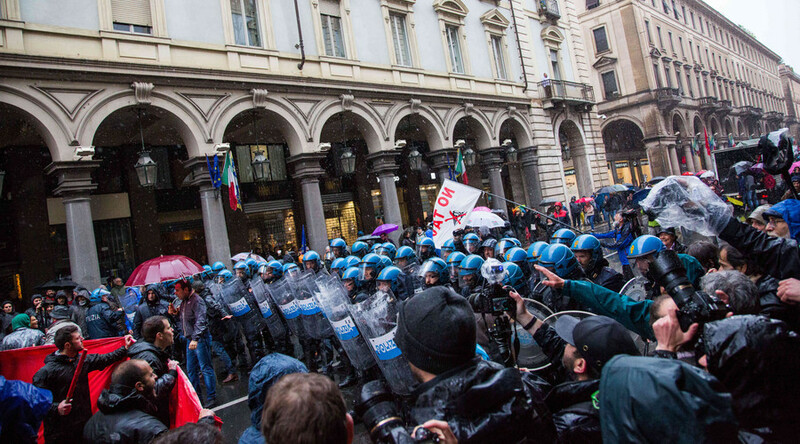 The brawl erupted on the Via Roma street in central Turin, when police tried to bar a group of around 50-200 protesters from the Piazza San Carlo where union leaders were delivering speeches to mark May Day. The rally had been peaceful up until then. Riot police were then pelted with eggs and other missiles before the stand-off erupted into a melee with a group of around 20 masked protesters armed with flagpoles. Police fought back with truncheons and used pepper spray. At least three protesters were arrested, and at least one demonstrator was reported injured. After the confrontation and ensuing stand-off, which lasted around 15 minutes, the protesters were eventually allowed to enter the Piazza San Carlo. According to La Stampa, thousands had turned up for the march on Monday morning despite the rain. Participants included members of the Italian Communist Party and No Tav, a movement against the development of high-speed railways. Some of the marchers held up a banner saying “Infamous Poletti,” referring to the current Italian Minister of Labour and Social Policies, Giuliano Poletti. May 1, International Workers Day or May Day is celebrated as a holiday in many countries and it is marked with a series of protests and demonstrations. Violence also broke out between police and protesters on the streets of Paris, where Molotov cocktails were thrown at riot squad officers. In Istanbul, over 200 people were arrested and one man was reportedly killed.